Okay, so I like food to sound like fun…you can call this what you want. But it’s a great way to use those zucchinis neighbors are leaving on your porch (and just a hint people, if the zucchini is big enough to use as a weapon, don’t try to foist it on friends and family, just compost it). 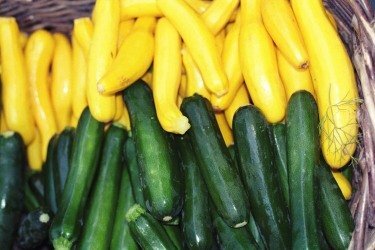 In skillet, heat oil, sauté zucchini, summer squash, corn, pepper and onion until squash is tender and onion is translucent. Add garlic and sauté for 1 minute more. Mix 2 tbsp oil and 2 tbsp red wine vinegar, salt & pepper to taste and toss with vegetables. *when chopping vegetables for confetti, it works best if you dice them to similar sizes. They don’t necessarily need to be small pieces, but uniform gives the best effect. That looks good. I’ll add it to my inventory. What I do with tons’o’squash is make a bunch of squash bread (think pumpkin bread using other squash as substitute) and freeze it. Since it’s a heavy bread the freeze/thaw cycle doesn’t ruin a delicate structure, and it still toasts nicely after thawing. Makes it a great treat for a surprise situation.